Bräustüberl Weihenstephan and beer garden is located on the Weihenstephaner Berg, a hilltop next to the Weihenstephan Brewery in Freising, 43km north of Munich. The beer garden offers views of the surrounding area. Weihenstephan is known for being the oldest, still existing brewery in the world. 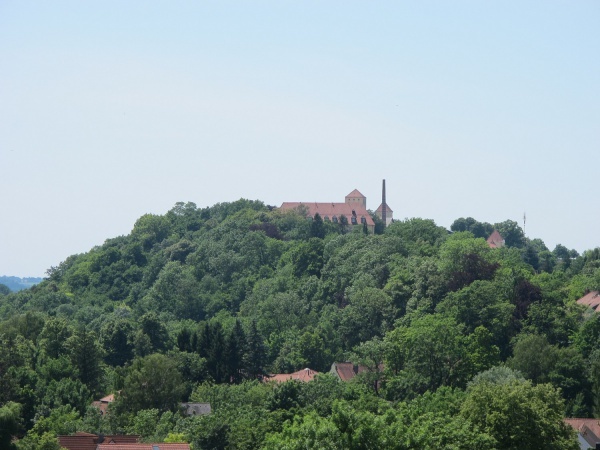 In year 725 the Benediktiner Monastery was founded on the Weihenstephaner hilltop. Here the monks invented the brewing of beer and in 1040 the Klosterbrauerei Weihenstephan was officially opened. During the next 1000 years the monastery went through many difficult times. Weihenstephan was ran over and destroyed amongst others by the Swedes, French and Austrians. Besides that, the monastery burnt completely down four times. Even the heavy earthquake in 1348 and three plague epidemics did not make the monks give up! Unfortunately, in 1803 the monastery was closed and all the interiors and property rights went into the hands of the State of Bavaria. However, the brewery business was under the control of the Royal Staatsgut Schleißheim (district of Munich) and could therefore continue. In 1852 the Bavarian Brewery School moved from Schleißheim to Weihenstephan where the art of brewing is still taught. 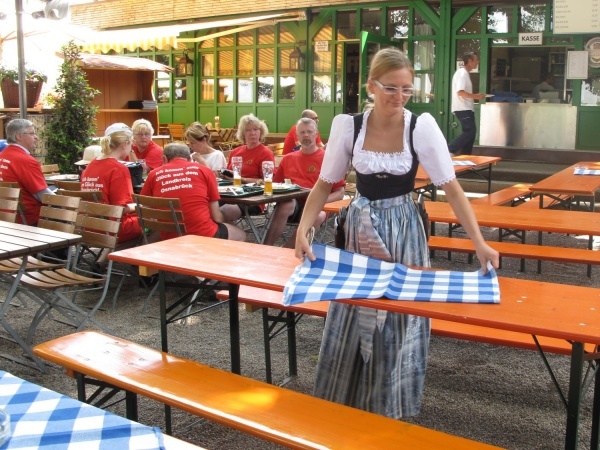 Today, the location is the centre of the brewing technology in Germany and even worldwide. The beer garden has 360 seats in the self-serviced area, 100 seats on the serviced terrace and 80 seats in the beer garden Salett'l, an outside roofed seating area. Large broad-leafed trees completely shade the self-serviced area while the serviced tables are shaded by sun-umbrellas. Apart from beeing the oldest brewery in the world, Weihenstephan is the birthplace of the "Obatzda", a Bavarian cheese specialty. 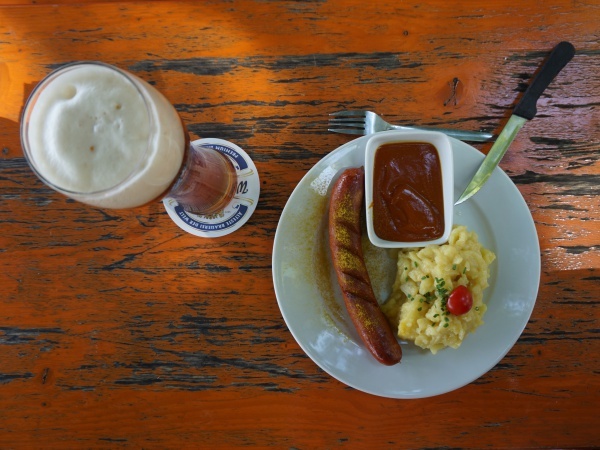 Katharina Eisenreich, the Innkeeper of the beer garden between 1920 until 1958, began serving homemade Obatzda to guests, which soon thereafter became a traditional Bavarian dish that is sold in every beer garden today. Industrial production of Obatzda, including export products, is still only done in Bavaria. Besides the Hell (lager) Bräustüberl Weihenstephan offers a wide selection of Weißbier (wheat-beer). A Maß Hell costs €6.80 (MJuly 2017). 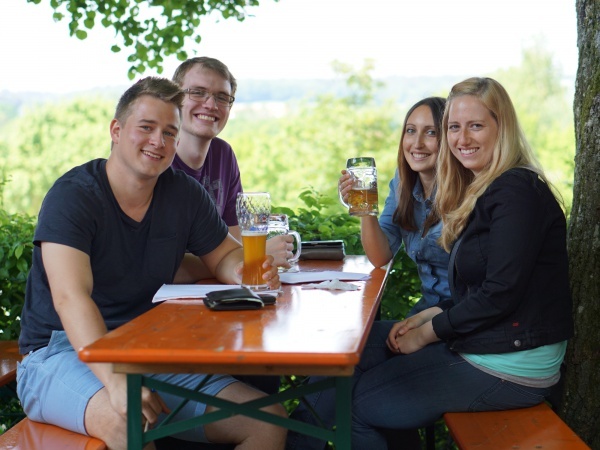 The Bräustüberl Weihenstephan beer garden is open depending on the weather daily between 10am and midnight from April/May until September/October. Additionally, there is a shop in the blue and white factory building where various beer types and souvenirs are sold. The shop is open weekdays from 10am to 1pm and from 2pm until 5pm. This page was last modified on 18 May 2018, at 19:15.